A very nice lady said to me the other day, “Don’t get old”. Translation…It’s no picnic when I hurt much of the time, and I miss my family and my loved ones and that makes me sad and lonely, or I hate the fact that I can’t do certain things for myself anymore. Bette Davis said, “Old age ain’t no place for sissies”. Boy was she right! I wonder at times what I will be like when I am 80 or 90 years old. Heck, I guess I have to make it their first; which is an accomplishment in itself. I know a lady that is turning 100 next week. So far in my life, I have personally met four people that have lived a century or longer. All I can say is wow! In a world where we seem to be struggling just to make it through another day, these people have struggled to make it through a hundred years. 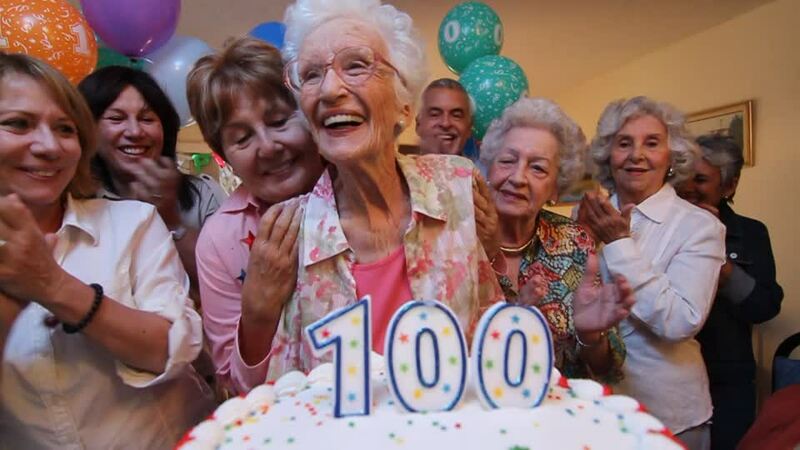 Unfortunately, the reality of joining the centenarian club may not be as cheerful as you think. Only 0.02 percent of the American population makes it into the club; and of that number, 4 out 5 are women. Obviously women know something we men don’t. I’d be lying if I didn’t admit that overall, I think women are tougher than men – which is why they have near exclusivity in the club. Men just don’t have the right stuff to join. Also, nearly 17 percent of centurions live in poverty; that is double the number of people age 65. Many have outlived their children and a third lives alone. Although the odds are not in my favor, I’m pretty sure if I live to be 100 years old I will want to live with someone, anyone! I can barely take care of myself now. California has the highest number of people over 100 years of age. New York is second. I’ve always wanted to visit California to see the giant Redwood trees and experience a train ride along the coast. Now I have another reason to head west. I’m definitely not heading north. Would you like to live to be 100? Alexander Heyne’s article, “5 secrets to live over 100 years old”, indicates that the number one factor in living to be 100 is family. It’s important to see them, visit and interact with members often. Of all the cultures researched regarding longevity, social interaction, whether it’s with peers or an in home care provider, is the main common denominator. The second secret is not to smoke. Ok, no surprise there. The third secret is to have a diet that is high in plant-based foods. This doesn’t mean you can’t eat meat, just eat more stuff that grows out of the ground. Good advice. The fourth secret shocked the heck out of me. A constant low level of exercise was a common thread among people that lived to be 100. Translation…stop killing yourself with extreme workouts. Consistent moderation in activity is the best. Now I know why my body aches all the time – I’m doing too much. Activities like hiking, gardening and farming all prove to be excellent ways to keep healthy. The last secret is no secret at all. Socialization is the key to living longer. We are born as needing love and affection and we need heavy doses of family and social contact to make it in this world today. Even if we don’t live to be 100! With 80% of long-term care in the United States being provided by family or other informal care givers, your loved one may not be getting all that they need to live a long life. An in home care giver can provide not only daily living assistance but can also ensure your loved one will eat a healthy balanced diet, maintain a low level fitness routine, and most importantly have daily social interaction. If you’re worried about an aging family member’s longevity you might want to consider the benefits an in home care provider can offer.